DP: You’ve been a photography curator for 18 years, firstly at the Musée d’Orsay and then at the Centre Pompidou. Over this period, what would you identify as the main changes both in photography and in the role of being a photography curator? QB: In photography this was the period of the shift from analogue to digital – a big technical change. Thanks to that change I think we’re more and more aware of the ubiquity of the photographic medium. When I started in the mid-1990s working at the Musée d’Orsay (I was already interested, in modern and contemporary photography at that time), I had the impression that photographers at that time were working for the museum and for the gallery space. The important experience was that vertical experience of having images that were objects, but that were meant to be seen in the gallery or around the museum. That was the generation of Andreas Gursky, Cindy Sherman and so on. But that was just a moment in time. I have the feeling that now we tend to realise that photography has another history, in fact it has other histories, and that it’s not only a print on the wall but that it can also be photographs printed in books, seen on screens, seen in installations, slideshows, etc. This is what I’m referring to as a more ubiquitous form of photography. And this is something that I really think is assuming more and more importance. Here at MoMA it means that, more and more, we have to work with other departments, and with our library, because they also collect photography in artist books, and so on. We have to be really aware of that ubiquity. The other thing would be that for the former generation of curators, the problem remained one of access to the images. Now I think the problem is that we have access to too many images, especially because of the Internet. So it’s not about trying to find images, but about trying to establish new filters. We have access to an overwhelming flow of images – I think it’s the first time in history that we have access to so many images. So we must establish new filters. For John Szarkowski or even in the 1980s, the problem was really about access to images, and even at that time we were rediscovering photographers who are today considered as the greats. If you have a look at modern photography, for example, people such as Claude Cahun were not really well known in the 1980s. We also rediscovered the work of Lee Miller and Dora Maar, just to menton a few names that are today very well known. Of course, we keep rediscovering photographers, but I think the problem is radically different today. So these are two changes: more ubiquitous and, in a way, too accessible. DP: In previous interviews I’ve read with you, you’ve said that one of the roles of the photography curator is to ‘educate the eye’. Whose eye are you referring to? QB: We have different audiences, so when we talk about the public, we should talk about the ‘publics’. We have, of course, a public who is very knowledgeable about artists, curators, historians, collectors – people who are really interested in photography. And then we have a much more general public. But I have a feeling that even the general public is more knowledgeable about photography than they were twenty or thirty years ago. I think that we do not need – as we probably needed thirty years ago – to always go back to the beginning of photography, to have that kind of history of photography. I think we are addressing a more knowledgeable public and a public who is also more interested in photography. They take photography much more for granted. It’s part of the arts and we don’t have to tell that whole story of the beginning of photography and the way that photography became an art form. ‘Educating the eye’ of all these publics means that we must find new ways to tell that history. We must first be aware that we are not telling the history but a history, and that the history we are telling is probably different from the history told by other institutions. We are not telling the same history when you are in a fine arts institution, compared to when you’re in a photography museum which collects photography not only as an artistic medium but also as an anthropological or cultural factor. So we are only telling a history of photography and we must find new ways to tell it. DP: As you said, MoMA is a fine arts institution and collects along artistic lines. However, I noticed on the MoMA website for the photography department that it says ‘as diverse as photography itself, the collection includes work not only by artists but also by journalists, scientists, entrepreneurs and amateurs’. Under what circumstances does work by these non-artists enter the collection? DP: Would you agree that collecting non-art photography can turn the curator into something of an artist? QB: Yes, in a sense. I prefer not to have the curator as an artist, but the artist appropriating vernacular and non-artistic forms. But this is an ongoing discussion that we are having. DP: In terms of what photography is collected and where, does the split between the art museum and, say, the library, concern you? QB: That split is definitely okay with me. I think that we should definitely consider ourselves as being a fine arts institution and acknowledge that we collect only one part of photography. There are other institutions that tell other narratives of the history of photography. We’re only telling one narrative. But let’s not pretend that we’re collecting photography as an autonomous art form. DP: You mentioned that photography in the museum seems to be increasing in popularity. What do you think accounts for that? QB: Firstly, everyone is a photographer. So it’s really a democratic language, everyone seems to have direct access to photography and maybe because everyone takes photographs, everyone thinks they can have an opinion on photography. Maybe in a way photography is less intimidating than some other mediums as you see photographs everywhere, all day long. I think it’s a less intimidating medium and a more democratic medium, and probably something that is easier – I don’t think to ‘understand’ because I think it is rather complicated – but which gives the impression of being more accessible. DP: The ubiquity of photography arguably makes the curatorial role of photography even more important, in terms of contextualising, filtering and so on. Traditionally, the museum has been interested in the ‘object’, which of course is at odds with the way photography is primarily experienced today outside the museum. In one of your interviews you mentioned that the museum of the future would not only be collecting prints but also media installations, files and images made especially for websites, and that the museum will have to adapt. Can you say a bit more about that? QB: Well, I think that we are working today, more and more, in both the physical museum and the virtual museum. It’s not only about working on the website – as a kind of a mirror of the physical museum – but it’s also trying to address a new public. The Internet is a platform and it’s not about just putting online the images that we have but addressing a new public – including works that are meant to be seen online. Not just images that are put online, but installations based on photographic work, video and moving images that are made for the Internet. So this is something that we’re thinking about, that we will probably have to build in the future, but that really is not only about photography it’s also about new media (we have a department of media at MoMA) and it’s also about graphic design and architecture. We are in constant dialogue with our colleagues, and this is something that we will have to work on in the future. But as you know, the fact is that the art market is very object-based, and very reluctant to shift because it means finding a new economy for that market. When you sell virtual images it is something totally different to when you sell an object. So it will take a little time. I think that some contemporary artists are interested in the virtual world, but maybe they’re a bit reluctant because the art market doesn’t follow. In the future, the art market will probably have to invent new rules and a totally new system that will take into account these new forms. DP: Can you think of any successful example of museums or art galleries incorporating online or networked photography? QB: I recall some interesting experiences at the Museum of Contemporary Photography in Chicago. DP: When Peter Galassi retired I remember there were some rumours that MoMA’s medium-specific departments might be dissolving. In your view, do we still need photography departments? QB: I think we still need a photography department to acquire and to conserve, because we still need to have that kind of connoisseurship around photography. But I’m not sure that we need medium-specific galleries anymore. We had that kind of history for a long time, which was inspired a lot by MoMA’s ideas and by John Szarkowski especially, to have that autonomous history of photography in the medium-specific gallery. And that was a model that was in fact copied by nearly every institution in the US. Now every fine arts institution has its photography department, with medium-specific galleries telling approximately the same stories with sometimes the same images, from early photography to contemporary photography. Even if these are sometimes modern institutions, they think that they have to start with the very early material. I think that maybe it is time to try to tell another narrative. Trying to tell another narrative doesn’t mean that we have to get rid of the older narrative, but I think we need to add another layer. I think if we get rid of medium-specific galleries – which I would be perfectly fine with doing – you could still tell that old narrative and let’s say, have in one room Lee Friedlander, William Klein and Robert Frank. But if you add to that dialogue some free cinema of the late 1950s and early 1960s by American filmmakers who were interested in street life and the urban signs, and if you add to that room some pop, or pre-pop painters of the same period…. That’s what I mean by adding another layer. You keep that narrative which is today quite well known and has often been told, but I think you give it a new perspective, a new dimension and a new point of view if you add these other layers. If you have a look at what’s happening in Europe – if you have a look at the Tate Modern, the Stedelijk in Amsterdam, even at the Pompidou or at the Reina Sofia in Madrid – I think you have much more integrated displays of photographic collections than in the US. But maybe this is because the US initially had that kind of obsession with ordering. Perhaps the future – and we’re planning an expansion of the museum – might present an opportunity to re-think the whole organisation and the way the collection is presented and displayed. Maybe not getting rid of, but definitely moving toward a more integrated display of the collection. Which doesn’t mean that we must get rid of the medium-specific galleries – I think we should still be able to do some medium-specific shows, because there are still some photographers dealing only with the photographic medium and only interested in that medium. You should not throw out the baby with the bathwater. But I think it’s definitely time to have a more integrated display of the collection and to try to tell another narrative. And when I say this I don’t feel I’m being very revolutionary, it’s something that is happening elsewhere. DP: Are there any expectations or pressures from the public, artists or other stakeholders towards that way of thinking? QB: I would say there are different forces. I could also think of many forces saying, ‘You should stick to the traditional history’. Of course there are forces of photography collectors who would love to see their photographers exhibited next to Warhol paintings. I can think of many photographers dealing only with photography – ‘old-school’ or ‘new-school’ photographers who are only interested specifically in the single medium – and who think that MoMA has to stick to that history and has to remain a place where you can still see photography exhibited as an autonomous art form. I can think of the general public and still see the same differences between the section of the general audience who are only interested in photography and the section who are more open to this dialogue between different techniques. So, there are different forces, but this is why the decision that we take must be based on intellectual conviction. I’m really convinced that we must move in that direction. You know for years, in that institution that was MoMA in the 1960s, ’70s and ’80s, you had these departments that would never work together, with each department operating in a silo, focussing on its own medium and definitely not talking to each other. I think that things are changing now because we must follow artistic practices. Even if, as I was saying before, you have some photographers that stick to one medium, you also have a lot of artists who go from photography to video to installation to painting, artists who have an idea and who try to find the best medium or process to express that idea. And it’s the role of the institution to adapt. DP: Finally, how have you found being the first non-American Chief Curator of Photography? QB: I know the American history of photography very well, and arrived from Europe with both histories. I have a feeling I know the American history much better than Americans know non-American histories of photography. Having said this, and with all that knowledge of photography, I still think that we must do things a little differently. 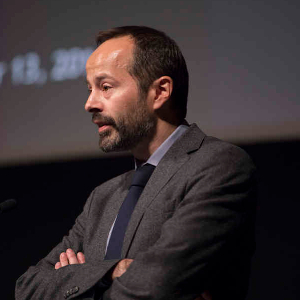 Quentin Bajac has been Chief Curator of Photography at The Museum of Modern Art since 2013. He was previously photography curator at the Musée d’Orsay from 1995 to 2003, then at the Centre Pompidou as Curator and then Chief Curator from 2007 at the Cabinet de la photographie of the Musée national d’Art Moderne. He has curated numerous exhibitions both on modern photography (Jacques Henri Lartigue, 2003, La subversion des images-Surréalisme, film and photography, 2009, Brancusi, film and photography, 2011) and contemporary photography (Bernd and Hilla Becher, 2004; William Klein, 2005, Miroslav Tichy, 2008, Dreamlands, 2010).